Well, after a planning and construction process that's began nearly five years ago, Safeco Field is finally nearing completion. This amazing project promises to provide Seattle with one of the premiere baseball stadiums in the nation, and the DJC is happy to provide its readers with a comprehensive look at the design and construction of Safeco Field. Safeco Field is the latest jewel in the Emerald City's crown. Everyone knows baseball fans are stat hounds. The Journal has provided a potpourri of figures, dates and data on the new stadium, the retractable roof and the field itself. We went to the sources to find out how Safeco Field was designed. Ann Donahoe of NBBJ, the firm that designed the ballpark, discusses the approach the firm took to creating a stadium that's state-of-the-art while preserving the nostalgic feel of a classic ballpark. We also wanted to hear from the engineers, who did an amazing job building such a structure on a very difficult site. Engineers from Skilling Ward Magnusson Barkshire talk about the ins and outs of designing a roof with wheels, and geotechnical engineers Shannon & Wilson tell readers how you build a monolith like Safeco Field on ground that you'd have trouble securely staking a pup tent in. And, as you may have guessed, all of Seattle is abuzz in anticipation of the opening of Safeco Field. The DJC pooled some comments from local business people and politicians on what the stadium will mean to Seattle. And DJC real estate editor and Marc Stiles gives his own two cents on what the stadium means to a die hard baseball fan. Those and other stories make up The Seattle Daily Journal of Commerce's salute to Safeco Field. Thanks for reading, and go Mariners! An overview of Safeco Field's many features and the ballpark by the numbers. With the promise of baseball outdoors, natural grass turf and amazing sight lines, this state-of-the art ballpark steeped in tradition gives new life to Major League Baseball in Seattle. One of the most talked-about features of Safeco Field is the retractable roof. Here's a look at the roof, how it works, and why it's designers are confident that it will keep Mariner fans dry. Structural engineers are usually hired by architects and developers to keep their planned buildings from moving excessively in windstorms and during earthquakes. Yet for Safeco Field, Skilling Ward Magnusson Barkshire was hired to engineer a structure that not only was supposed to move, but was meant to move horizontally a distance further than the Space Needle is tall. 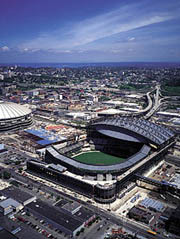 Though it was on a fast track, Safeco Field was three years in construction from final site selection to tossing the first pitch. At Safeco Field, fans will notice the pristine playing field, the stately facade and the nostalgic acoutrements of the stadium. But what may go unnoticed is the significant contribution of minority and women-owned business enterprises to the stadium's construction. How does SoDo become a LoDo? Why does anyone want it to be like a LoDo? What is a LoDo? These and other questions may be answered as the ripple effect of Safeco Field on surrounding real estate begins to take effect. To plan a ballpark that represents the best of all worlds, Joan Enticknap knew she and a team of planners and designers would need to log a few miles. So you've got 34 months to build a Major League Baseball ballpark that would normally take 50 months to complete. What to do? If you're the general contractor, Hunt-Kiewit Joint Venture, you take the your strategy from a page of the Mariner's playbook: if you want to succeed, field a team of all-stars. Ever tried to stake a tent on a sandy beach? While the site for Safeco field might not have been the best place for beach volleyball, the loose fill and high water table of the ground created quite a challenge for project engineers. Hear what some of the ballpark's neighbors and other city leaders have to say about Safeco Field and what it means to Seattle. After years of suffering in the Kingdome, a die-hard baseball fan (and DJC reporter) rejoices. With that spectacular rolling roof it's easy to overlook the actual playing surface at Safeco Field. Don't.